In a delayed New Year's post, I am am going to admit that, in general, we don't do a lot for New Year's Eve. This is in part because we used to have a big family dinner on New Year's Day, but our ushering in of the new year is a little more tame now that the in-laws have their new place up near Mendocino, a good three-hour drive away. Five if you stop at a winery or for lunch. Or both. Or just the wine. 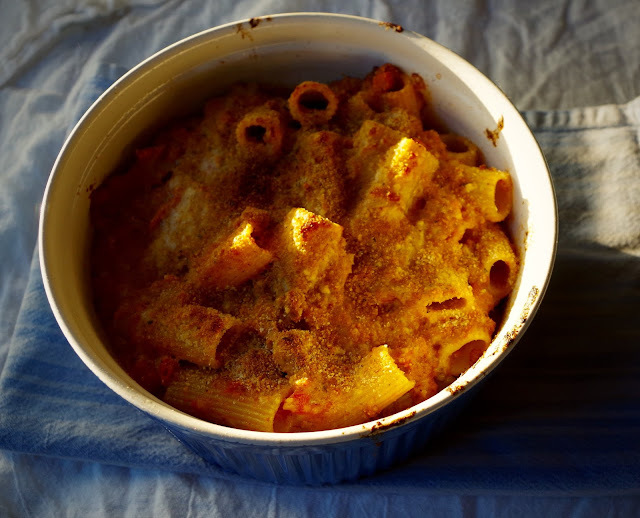 However, for New Year's Eve this year, I did make this baked pasta dish from the famed Marcella Hazan. Combined with a salad, it made for a hearty way to end 2015 and ensured that a few weeks of restraint were in the hopper for 2016. This recipe is a two-day process, given that you need to make the Bolognese Meat Sauce. However, that sauce is pure perfection, so if you make it, make double the amount. Half of it you can use here and the other half can be used how ever you like. Which might just mean eating it with a spoon from the pot. I won't judge. I posted on the meat sauce last month, so you can find the recipe there. But if you're in a pinch, use whatever good meat sauce you have on hand. I did make some adaptations, mostly because you and I both know I have a proclivity for sauces. 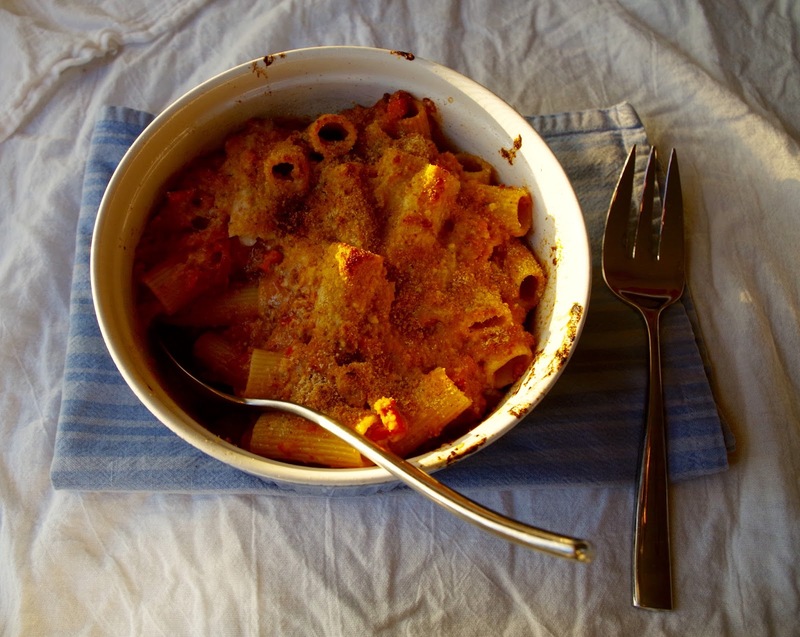 Consequently, I halved the pasta, a modification reflected in the recipe below, and I added bread crumbs. 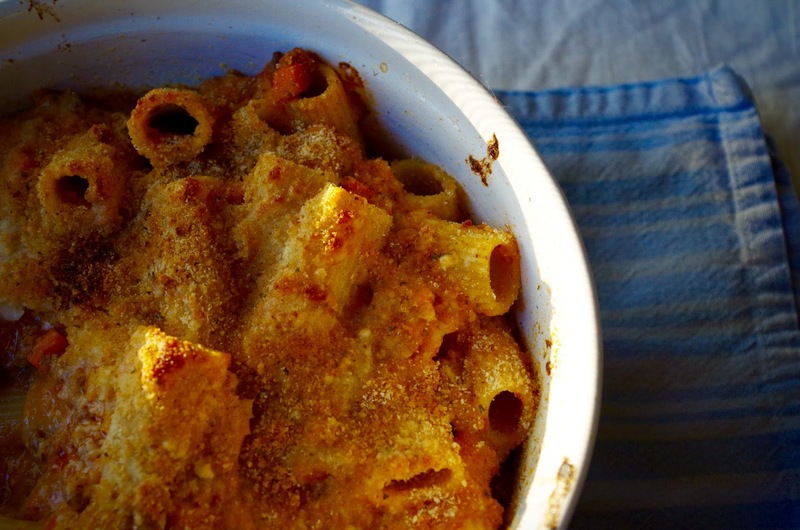 Because, people, I love breadcrumbs on baked pastas. I am not alone. As I said, the dish is hearty. A diet must ensue the day or two afterwards--but we all made that our New Year's resolution, anyway, right? Anyway, it's about that time that we're about to break the resolution, so dig into this simple dinner to feed a group. Buon appetito e Felice Anno Nuovo! 1. Make the Bolognese Meat Sauce. You need 2 rather full cups. 2. To make a béchamel sauce: put the milk in a saucepan, turn on the heat to medium low, and bring the milk just to the verge of boiling, to the point when it begins to form ring of small, pearly bubbles. 3. While heating the milk, but the butter in a heavy-bottomed, 4- to 6-cup saucepan, and turn on the heat to low. When the butter has melted completed, add all the flour, stirring it in with a wooden spoon. Cook, while stirring constantly, for about 2 minutes. Do not allow the flour to become colored. Remove from heat. 4. Add the hot milk to the flour-and-butter mixture, no more than 2 tablespoons at a time. Stir steadily and thoroughly. As soon as the first 2 tablespoons of milk have been incorporated into the mixture, add 2 more and continue to stir. Repeat this procedure until you have added 1/2 cup milk; you can now pour in the rest of the milk, 1/2 cup at a time, stirring until all the milk has been smoothly integrated into the flour and butter. This slower process keeps the sauce from being lumpy. 5. Put the pan over low heat, add the salt, and cook, stirring without interruption until the sauce is as dense as thick cream. You want a medium-thick béchamel sauce. To make it even thicker, cook and stir a little longer. 6. To make and assemble the pasta: Preheat the oven to 400 degrees. 7. Cook the rigatoni in abundant, boiling, salted water. Drain when exceptionally firm, a shade less cooked than al dente because it will undergo additional cooking in the oven. Transfer to a mixing bowl. 8. Add the meat sauce, béchamel sauce, and 3 tablespoons grated Parmesan to the pasta. Toss thoroughly to coat the pasta well and distribute the sauces uniformly. 9. 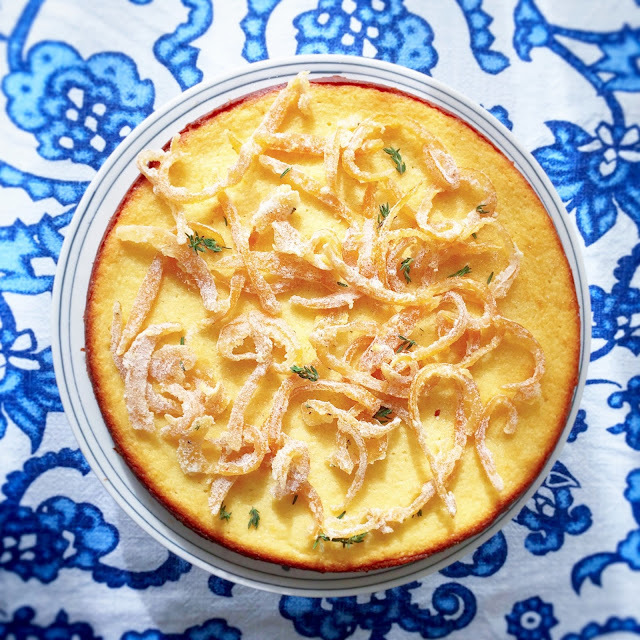 Lightly smear the baking dish with butter or spray with cooking oil. Put the entire contents of the bowl into the baking dish, leveling it with a spatula. 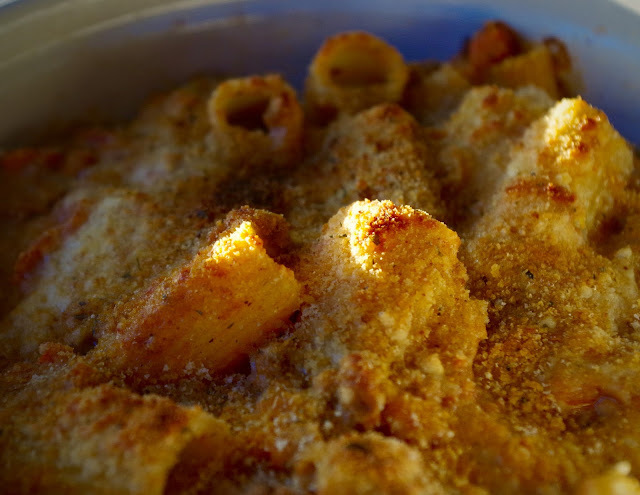 Top with 3 tablespoons grated cheese and the bread crumbs. Put the dish on the uppermost rack of the preheated oven and back for 10 minutes, until a bit of a crust forms on top. If you want it extra toasty, put it under the broiler for a minute or two. 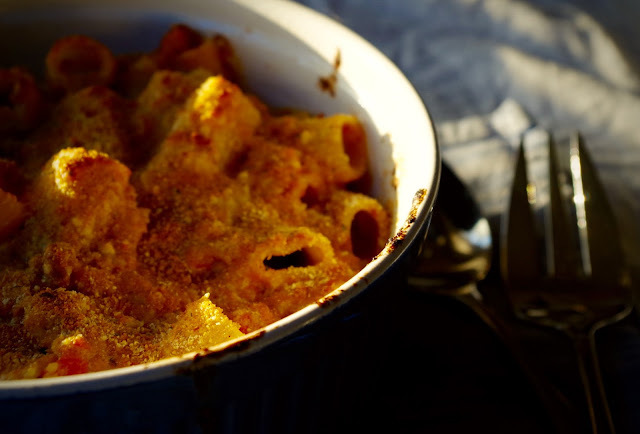 After taking it out of the oven, allow the rigatoni to settle for a few minutes before bringing to the table.